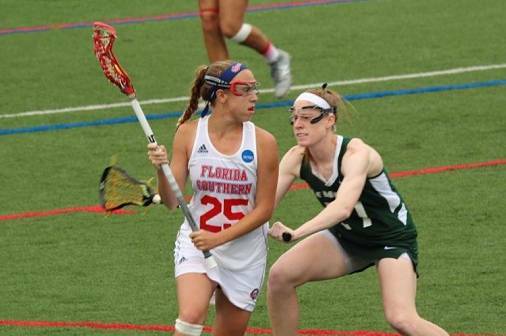 LAKELAND, FL – Florida Southern College women’s lacrosse head coach Kara Reberreleased her schedule for the 2019 season on Wednesday. Entering its second season on Moccasin Field at the Barnett Athletic Complex, the Mocs will take to the field nine times a home. Florida Southern will make two trips out of the state of Florida with trips to North Carolina (March 7-10) and Ohio (April 12-14). 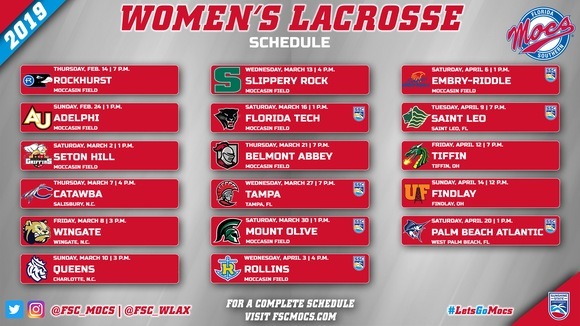 Florida Southern’s 2019 opponents consist of a pair of teams that made an NCAA Tournament appearance last year (Adelphi and Florida Tech) and three additional teams who ended the season ranked in the IWLCA top 25 (Rollins, Tampa, and Tiffin). Also included in the mix are a trio of opponents the Mocs will face for the first time ever (Findlay, Slippery Rock, and Wingate). The Moccasins’ 2019 foes combined to go 189-120 a year ago, good for a .612 winning percentage. The Mocs will open the season with a pair of home games in February, Rockhurst (Feb. 14) and Adelphi (Feb. 24), and will host Seton Hill (March 2) before heading to North Carolina for three games against Catawba (March 7), Wingate (March 8) and Queens (March 10). For the first time in program history, the Mocs will take on Slippery Rock (March 13) at Moccasin Field. Florida Southern will begin its quest for its fifth consecutive Sunshine State Conference championship when it hosts Florida Tech (March 16). March will end with home games against a pair of teams from the Conference Carolinas in Belmont Abbey (March 21) and Mount Olive (March 30) with a conference game at Tampa (March 27) in between. The final homestand of the season follows with Rollins (April 3) and Embry-Riddle (April 6). The final four games of the season are on the road as Florida Southern will take on Saint Leo (April 9) before traveling to Ohio for a pair of games at Tiffin (April 12) and at Findlay (April 14). The final game of the regular season will be at Palm Beach Atlantic (April 20). The Sunshine State Conference Tournament, which Florida Southern has won in each of the past three years, will take place on April 25 (semifinals) and April 28 (finals). The school that wins the SSC regular-season title, which the Mocs have done for the past four seasons, will host both rounds of the tournament. For the most up-to-date schedule, visit FSCMocs.com. PrevSite Update: Catching Up! And Some Explanations of Our Submit Buttons and Press Release Formats! NextMark Millon & JTAA Bring the Jupiter Lacrosse Classic to Florida – May 4th-5th, 2019!